It’s a Kevin Hart movie. That’s all you need to know before reading. Take it as a warning or a reason to keep reading, the choice is up to you. Hi-jinx ensue as Teddy and his newfound classmates struggle to keep up with four years of high school curriculum. Teddy also must come face to face with his fiancee, as he hasn’t ever told her that he is a high school dropout. Can Teddy balance night school and life? Night School is a Kevin Hart movie. It’s loud, its obnoxious, and there are ample jokes about Kevin Hart’s size and stature. 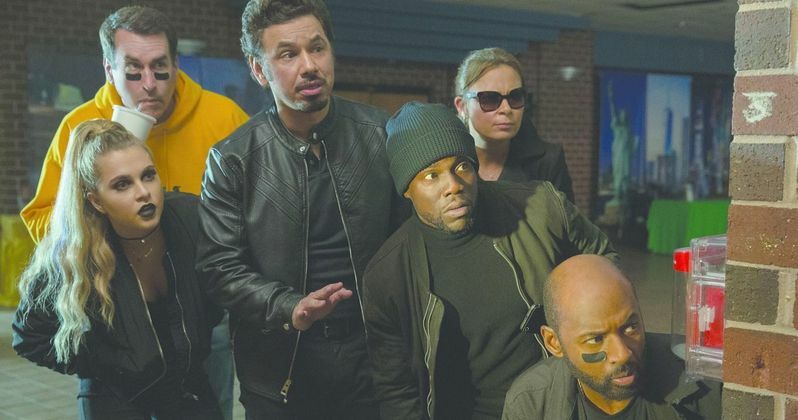 Unfortunately, Kevin Hart films are falling into the vein of Adam Sandler films. The plot is irrelevant, the humor is best fit for a thirteen year old, and the jokes are stale rehashes from the last Kevin Hart movie. I wasn’t excited for this movie going in. If not for a friend wanting to go I would not have even considered watching this in theaters. Before I dive into the review itself, I just want to make it clear that both my expectations and enthusiasm for this film were low before I actually watched it. That being said, those expectations were not low enough. Get ready people, this one is a doozy. As stated above, Kevin Hart is the new Adam Sandler. This is not meant as a sleight to either comedian, but it is the fact of the matter. So, what do I mean by this? Adam Sandler and Kevin Hart have both proven their comedic chops. These actors, when left to their own devices, are funny. Adam Sandler does weird voices and lampoons popular culture, Kevin Hart makes hilarious observations about himself and the world. The problem is, when these two actors are used to spearhead a comedy, they are shoved into a comedic box of loud noises, screaming, and fart jokes. Instead of exploring their talents and using their unique voices, studios often slap their faces on cheaply produced comedies for the sake of an almost guaranteed return. These movies don’t make a lot of money, but they don’t cost a lot of money to create either. While these movies are a surefire success for the studios, they are an absolute tragedy for the audiences. These films aren’t funny, they aren’t even engaging, they just are. Instead of delivering laughs throughout and delivering memorable characters, these films are forgotten as soon as the audience leaves the theater. Night School falls into this category, though sadly that isn’t the film’s only major issue. Most films have just one or two writers, though it isn’t uncommon to see three or four. A film should be careful when approaching four writers, extremely cautious with five, and should never use more than that. Night School has six. Six writers for an hour and fifty-one minute film is just ridiculous. In fact, any film feels disingenuous when so many writers have their pen to the page. With six different voices chiming in with diverging ideas, the film feels bogged down and Frankenstein-ed together. The story is filled with holes, and pacing is incredibly clunky at best. The majority of the film takes place over a few weeks as Teddy is introduced, loses his job, and decides to attend Night School. Then all of a sudden the entire semester happens in about fifteen minutes and the film wraps up. Often times characters take forever to be introduced and/or are then absent for long periods of runtime. The humorous part of this comedy falls apart almost as much as the story. Again, this ties into the mess of having six writers. The style of humor changes from slapstick, to satire, to tongue in cheek on a dime and that blend doesn’t mix well together. This is a shame considering the talented cast set to deliver the humor. Night School also suffers from the fact that many of its recurring gags just aren’t funny. What is also infuriating is the dynamic between Kevin Hart and Tiffany Haddish. The problem lies in the fact that they have the exact same comedic style. The scenes that the two actors share together feel like two Kevin Harts screaming at each other and making jokes about Kevin’s stature. Instead of complimenting each other, the two actors scream louder in an attempt to be heard above the other. Despite its many glaring defects, Night School shines bright in one particular way. The cast behind this film is absolutely magnetic together, despite the Hart-Haddish issue. Rob Riggle, Romany Malco, and Mary Lyn Rajskub in particular hit their beats more often than the principle actors. If only the cast had been allowed to improv their lines instead of following a six-writer script, this movie may have had potential. This has nothing to do with Night School, but is a fun little anecdote about Romany Malco. For the past four years, I have had a Twitter interaction with Romany Malco every February. It started when the Duff released in 2015. I made a Twitter joke about the film, and Romany Malco favorited the tweet. A friend of mine commented on Romany’s favorite and the three of us shared a short exchange. Every year since, my friend and I repost the original tweet on the same day and tag Romany, who has also replied every year since. I don’t know why we keep doing this, but its a funny anniversary each year. And hey; if I ever meet Romany Malco or if he ever happens to read this, we’ll have something to talk about. 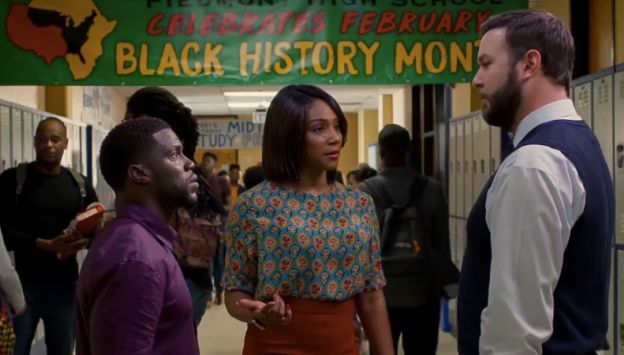 Kevin Hart has some solid films in his canon, but Night School is not one of them. The film misses its humorous beats and the plot falls into a predictable mess of ideas. Night School isn’t laugh worthy or noteworthy, it is just cringe-worthy. If you’re deciding between this or literally anything else in theaters at the moment, pick literally anything else. Thank you for reading! What did you think about Night School? Comment down below!